Nanopore sequencing is one of the next-generation sequencing (NGS) technologies believed to be capable of revolutionizing DNA analysis. Different modalities of nanopore sequencing have been developed over time, including protein nanopores, solid-state nanopores, and hybrid nanopores. The technology enables production of ultra-long reads at very high speeds, reducing sample preparation time as well as the data-processing time required to reassemble the reads into their original sequence. This novel technology could tap into a brand-new sector of customers who may require genetic fingerprinting for fast identification of cancer types and pathogens. 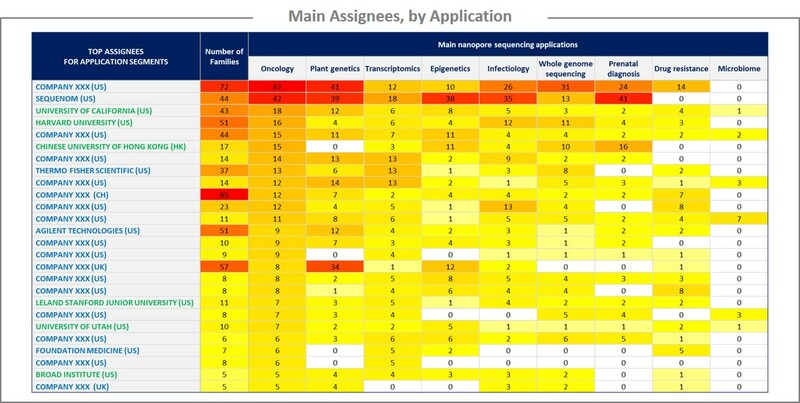 According to DataBridge, the global NGS market will grow fast, from $US 4.83B in 2017 to $US 16.35B in 2024, at an estimated compound annual growth rate (CAGR) of 19.2% (from 2018 – 2024). With new products launching in the near future, it is crucial to understand the intellectual property (IP) position and strategy of established nanopore sequencing players, while identifying the IP newcomers and the threat they represent. To this end, Knowmade has identified the key IP players involved in nanopore-based sequencing technologies (protein, solid-state, and hybrid) and their applications (oncology, plant genetics, etc.). Such knowledge can help detect business risks and opportunities, anticipate emerging applications, and enable strategic decisions to strengthen one’s market position. The analysis of the time-evolution of patent publications shows an important increase in nanopore sequencing-related patenting activity from 2008 – 2013. This increase follows the work of academic research teams (Harvard University and University of California) that proved the concept of nanopore sequencing. Even though the industrial players developing nanopore-based sequencing are steadily gaining importance, Harvard’s patent portfolio remains the strongest, followed by Illumina, Agilent, University of California, and Roche, whose influence in the IP landscape is growing. In fact, Roche is now the most prolific applicant in nanopore sequencing. Contrarily, Oxford Nanopore Technologies’ patent portfolio is not the strongest, but the company benefits from the numerous partnerships it has with universities (Harvard, University of California, and Boston University). Moreover, several companies with strong experience in microelectronics and semiconductors (Hitachi, IBM, Samsung Electronics, Intel, and GlobalFoundries) have recently filed patents claiming solid-state nanopores. Patents are categorized by nanopore technology (protein, solid-state, and hybrid) and by main application. Also, IP trends and the relative strength of each main patent assignee was analyzed. These findings reveal that solid-state nanopore-related patents are more numerous than those related to protein nanopore or hybrid nanopore. From an IP perspective, Roche leads for technologies related to protein nanopore, and Oxford Nanopore Technologies leads the solid-state nanopore and hybrid nanopore segments. Regarding applications, the main patented application for nanopore sequencing is oncology. Plant genetics, epigenetics, and transcriptomics are also important application domains for nanopore sequencing. Among the main applications for nanopore sequencing, microbiome analysis is the most recent, but already a few companies are positioned in this segment. KnowMade’s study includes IP profiles for key players and a description of their key patents. The key-patent analysis includes the legal state of the family for each of the main territories, the number of received citations, the review of main claims, the description of interesting features disclosed about the innovation, and relevant figures illustrating how the innovation works. This section also covers patents involved in litigations. This report also includes an Excel database containing the >7,200 patents analyzed in this study. This useful database allows for multi-criteria searches and includes patent publication numbers, hyperlinks to original documents, priority date, title, abstract, patent assignees, and each patent’s current legal status, as well as nanopore technologies and applications.